With all the talk about Curtis Granderson signing with the Mets last week, I thought I’d highlight a baseball card the commemorates the last time the Mets signed an aging star to make a statement. 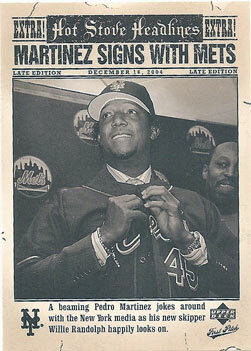 Pedro Martinez was a star of a different order of magnitude than Granderson, of course, but both free agent signings had as much to do with making a statement as they did with baseball. When the Mets signed Pedro to a four-year, $53 million contract nine years ago next week, they were coming off their third straight losing season and had just hired Willie Randolph to replace Art Howe as the team’s manager. In 2006, Upper Deck included a “Hot Stove Headlines” insert set in its “First Pitch” product. It featured 20 baseball stars who had recently changed teams and used black and white photos from the players’ introductory press conferences instead of more traditional baseball card action shots. Besides Pedro, two other Mets were included: Carlos Beltran and Carlos Delgado. There isn’t a lot of demand for the cards in the set – if you can find them, you could expect to pay around $1 per card.